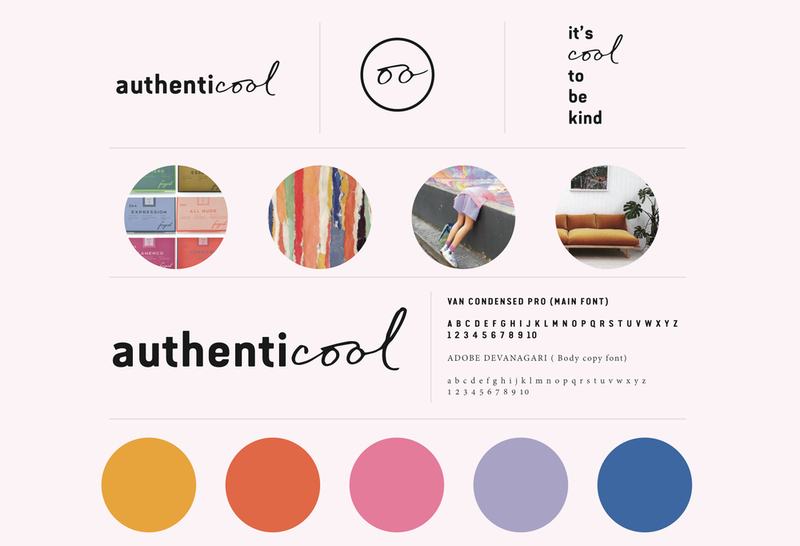 "Hi Tess, Authenticool needs to be authentic to me, I am a huge colour person and my house is decked out in all colours, eclectic furnishings and art. So colour needs to be heavily involved, I have a life-long goal to own a van and I would love, love, love to brand it Authenticool - stand out colour with logo's running down the sides! It will mostly be used for travelling in-between coaching clients but I am not ruling out the odd weekend road trip. I am also going to start hosting workshops and meet-up days for coaching clients, but first I need your help! .... UM YES! Count me in! After much brainstorming and pen to paper my design journeying brought me to create a logo that would have a timeless feel, lending to all ages allowing authenticool do expand however it needs as it moves forward into the rainbow horizon of the future. The secondary elements are where we will have the most fun, splashing colour everywhere! Below are some excepts of stage one in the branding process --- I'm so excited to show you more vibrancy as the brand expands into stationary, website & one day a magical van! ENJOY!